How fast does it take to become an addict? Two minutes and 39 seconds is how long it's taking listeners to become hooked on "Why Don't We Fall in Love" by newcomer Amerie. "We didn't know that it was going to be big," Amerie (pronounced A-Marie) said last week as she was getting ready to catch a flight from New York to L.A. "It really took off. It's gotten bigger faster than we expected." Amerie has what you would call a pleasant problem on her petite hands. The 22-year-old songbird is enjoying radio spins that rival those of airwave darlings Usher and JaRule with her debut single off "All I Have", which is supposed to drop this summer. Yet "Why Don't We Fall in Love", was not intended to be her first single. It wasn't intended to be a single at all. "The funny thing about it is that song was only supposed to be an intro to the album," she explained. "We finished recording it, and we were like, 'I'm always listening to that song. We should just make it a song.' It's just been getting crazy love." Amerie's label, Columbia, had sent the cut out as a teaser 12-inch to mix show DJs across the country to set up another song. Go figure -- they embraced her cotton-candy-sweet, schoolgirl-reminiscent styling over the jagged club beat of up-and-coming producer Richard Harrison, who helmed her entire album. Needless to say, it's the official single now. Familiar with traveling -- her family was in the military, so she's lived all over the world -- Amerie has been playing a bit of catch-up, jumping on flights to meet fans across the country so they can place the face with the song. This spring, she'll have no problem being recognized: She shoots her video on May 13 in L.A. and will perform during Nas' set on Usher's Evolution Tour. "For the most part, we're keeping it a surprise," she said off the set. "We're going to do 3 songs together. I'm opening the set up with Nas. Then I go into "Why Don't We Fall in Love! Then he's gonna come back out and we're going to do something together." Amerie is no stranger to the Queens microphone strangler. Besides being label mates, she sings on "Rule," the likely 3rd single from his Stillmatic LP. 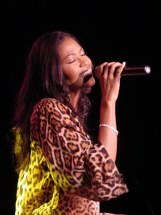 "[Nas] listened to some of my songs, and he really wanted to get me on a song of his," Amerie recalled. "It was the first time I met him. I listened to him, I say him on TV, but I didn't know what to expect. When I went in there [to record], he was really down-to-earth. They told me the topic of the song, they let me listen to it and I wrote. They let me open and creative with it." For those who can't get enough, Amerie's going back in the studio to record a new, longer version of "Why Don't We Fall in Love" which may include a cameo from a rapper or another verse by her. Amerie's would-be first single, wht dreamy-eyed love tale "Talkin' to Me," is supposed to drop sometime this summer as her second single. FYI, that tune checks in at 3 minutes, 54 seconds.